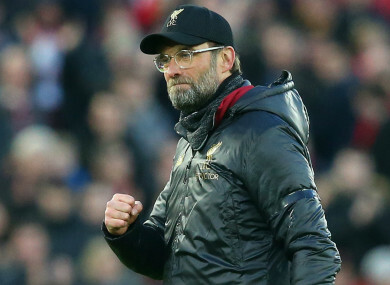 JURGEN KLOPP KNOWS what is at stake for supporters as the Liverpool manager eyes success in the Merseyside derby against Premier League rivals Everton. League leaders Liverpool – a point clear atop the table – will travel to Goodison Park to face Everton in a fierce showdown on Sunday. Former Mainz and Borussia Dortmund boss Klopp understands the value of derbies from his time in Germany, and he is determined to earn bragging rights for Liverpool fans. “Look, I was seven years at Mainz and seven years at Dortmund,” Klopp said. “When I came to Dortmund the first three games were Cottbus, Bayer Leverkusen and Schalke. Nobody spoke about the other two teams. “You have to learn. It’s not my enemy. How could it be? Schalke was not my enemy when I left Dortmund. But I understood 100 per cent what it means to the people because I had my derby when I was 10 years old and played against the village next to us. “We went to the same school and we went on the same bus. You want to win that game so desperately. That’s sports. I understand that but I don’t live that. Liverpool won the reverse fixture in dramatic fashion – Divock Origi’s last-gasp winner giving the Reds a 1-0 win over Everton at Anfield in December. “Of course goals can change a season,” Klopp said. “It [Origi's winner] changed the mood, of course, the confidence, of course. “It was a very important one, 100 per cent. That day and the games afterwards, it was unbelievable what the boys did. Meanwhile, Liverpool star and former Celtic defender Virgil van Dijk believes the Reds’ title pursuit gives them the edge against Everton. “I’ve played in the Old Firm derby, which is really intense. When I played Rangers were lower level-wise than they are now, so it was pretty easy back then,” Van Dijk said. “But this is the Premier League and it’s totally different. Email “'Fans can't win derbies in the office': Klopp determined to earn bragging rights for Reds fans”. Feedback on “'Fans can't win derbies in the office': Klopp determined to earn bragging rights for Reds fans”.